Earp widows, Maude (Cara Massey), Pauline (Tina Stafford) and Cara (Karla Mosley) in "I Married Wyatt Earp. Photos by Gerry Goodstein. BY 1944, Wyatt Earp has become a legend. In “I Married Wyatt Earp,” the Western saga is told from the feminine point of view. 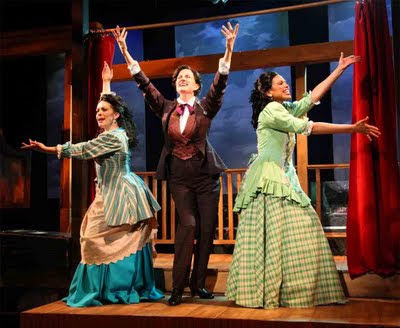 At 59E59 Theater through 12 June as part of Americas Off Broadway, “I Married Wyatt Earp,” is the story of Josie Earp and the pioneering Earp women. When the play opens, Wyatt’s widow, Josie (Carolyn Mignini), is consulting on a film based on the events at the O.K. Corral. Josie is haunted by Tombstone, Arizona and the life circumstances forced her to make for herself in the dusty frontier town. 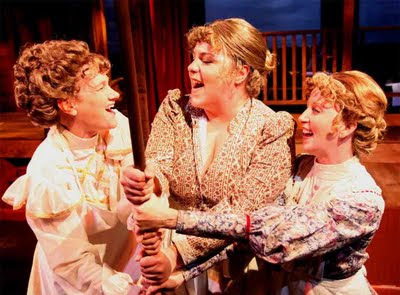 Scenes from her youth, staged to share the setting with her Los Angeles home, play out as “I Married Wyatt Earp” flashes back to the late 1870s, illuminating Allie and Josie’s reminiscences. Eighteen-year-old Josie (Mishaela Faucher), headstrong and independent, runs away from her comfortable San Francisco home. She craves adventure and joins Pauline Rackham’s (Tina Stafford) traveling show. At Tombstone, Young Josie reunites with the town’s sheriff with whom she had flirted at a party back home. The widows Earp each have young counterparts in the memory scenes who, pleasingly, physically resemble their older selves. Like Young Josie, Young Allie (Stephanie Palumbo) is so well matched to the widow Allie Earp that it’s easy to see them together as younger and older versions of the same woman. Young Allie, Virgil’s ambitious, capable, plump wife, manages the Earp saloon and leads the Earp wives in enterprises she trusts will make them all rich. The cast of eleven women in “I Married Wyatt Earp” does this smart, entertaining musical drama proud. It is based in part on Glenn G. Boyer’s book of the same name, which was written by Thomas Edward West and Sheilah Rae, who also wrote the lyrics. The music by Michele Brourman riffs on country ballads and folk tunes. “Games Are Everywhere,” performed by Kate Haroney (Ariela Morgenstern), the Hungarian gambling gal who is Doc Holliday’s lover, is written as a kind of Gypsy czardas. Songs like the pretty “Unpacking Dreams” and the catchy “Didya Hear?” and “Pins and Needles” all work to move the story along. “I Married Wyatt Earp” is thoroughly enchanting. It has a simple beauty. Adding to the purity of the sound – in this small space – no one is miked. Bring on the cast album! Visit http://www.59e59.org/ to learn more about "I Married Wyatt Earp."